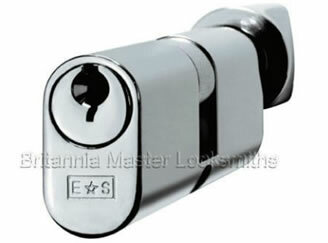 Euro or Oval profile cylinders also supplied in 5,10 and 15 pin with brass, satin chrome and polished chrome finishes. Depending on the thickness of the door there are many different sizes. 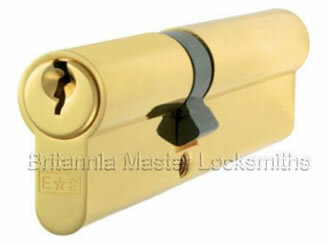 They come in 3 types, single/half, key and key (double cylinder), key and thumb turn. Single/Half profile cylinders are operated from one side only. 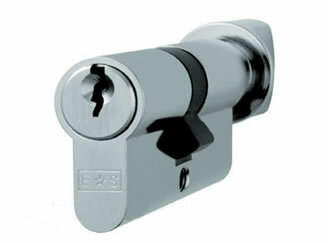 Euro cylinders are mainly fitted to uPVC doors but some aluminium and wooden doors also use this type of lock. Key and Key (Double cylinder) profile cylinders are operated from both sides only with a key. Key and Thumb turn (cylinder and turn) profile cylinders are operated with a key from one side and a thumbturn from the other, useful for controlled access from one side. This threat can be considerably reduced simply by upgrading the cylinder to one that is specifically designed to prevent this method of attack. It is recommend that all vulnerable doors using Euro-Profile cylinders be upgraded to incorporate 'Break Secure' cylinders.